← Advisory Board Question of the Month: Which new server virtualization technology are you most thankful for? Came across this Post for an issue when adding a new node to and existing Hyper-V R2 SP1 cluster where the new node did not get added as a possible owner of the CSV disks or of the Quorum. The presenting symptoms for me was DPMs inability to backup VMs that resided on a particular node since the ownership of the CSV could not be transferred to a node that was not allowed as a possible owner. Running Cluster Validation returns these warnings. For the Quorum, the change is easy. 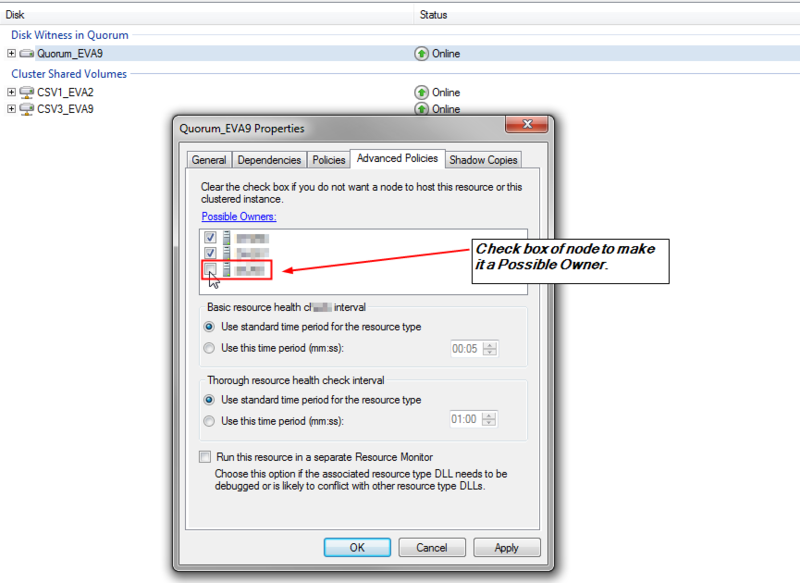 Just open the properties of the Quorum disk resource and on the Advanced Policies tab check the check mark next to the node to make it a Possible Owner. CSV disks this can be a bit more challenging however since you can not add or change the Possible Owner of a CSV from the GUI. Luckily you can do this using the CLUSTER.EXE utility as outlined in Gustavo’s Post. You could also use a PowerShell command to do the same thing. Looking at the Cluster Validation report again now will show that there are no problems with incomplete disk ownership. This entry was posted in DPM, Hyper-V. Bookmark the permalink.